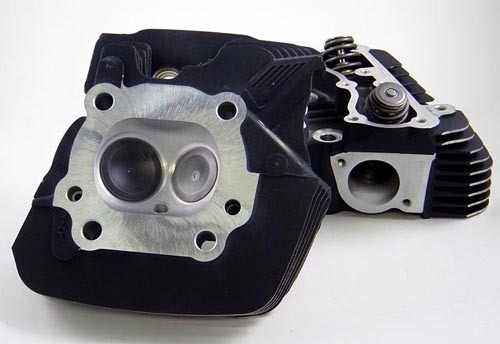 HAMMER PERFORMANCE is your source for the best performing Twin Cam heads out there! 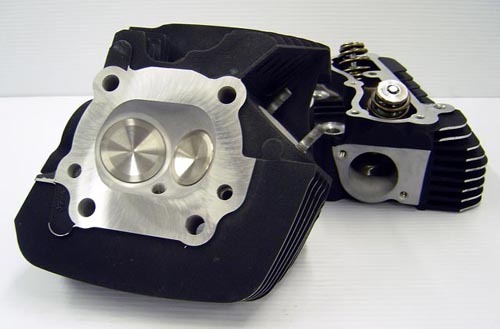 After years of development, we have what we believe to be the best port designs available for your Twin Cam heads. 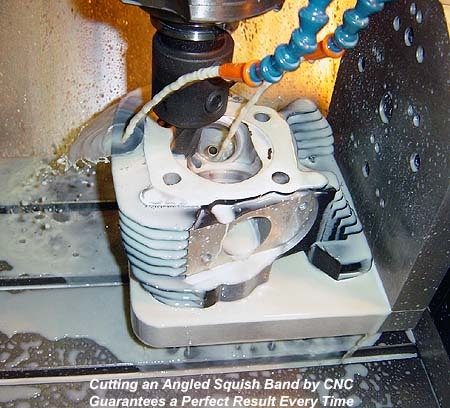 But we didn't stop there; to ensure consistency and quality in every head we ship, we also developed an exclusive 4-axis CNC process to expertly port your Twin Cam heads, including the unique ability to custom-size your Twin Cam's ports to the exact combination in your motor. 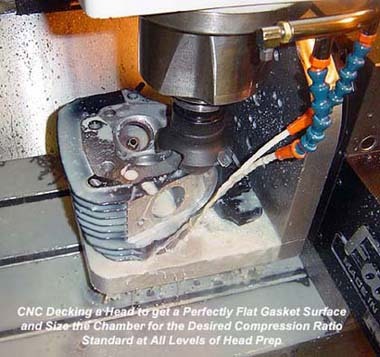 The Impact service treats your heads to our exclusive and proven 4-Axis CNC port treatment, followed by hand finishing, bronze manganese valve guides, a custom radius valve job, sizing of the chambers to achieve your desired compression ratio, and decking your heads to get a perfectly flat gasket surface. The Smash service adds to that our premium quality high flow oversized stainless steel valves and a spring/retainer pack that allows more lift and more aggressive cam lobe profiles. The Sledge service adds even bigger valves (with a seat change if needed), plus a port configuration custom sized to your specific engine and intended usage, as well as any optional special services such as angled squish bands or external head drains. The pictures below show some of the steps that ALL levels of head porting service include. 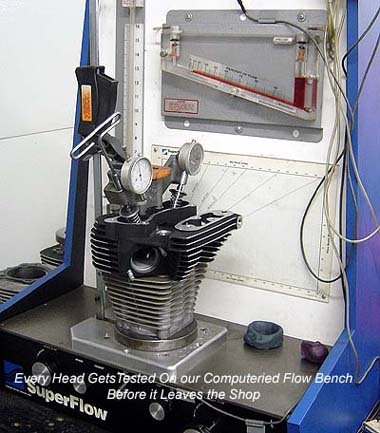 Make a Big Impact on your Bike's Performance! 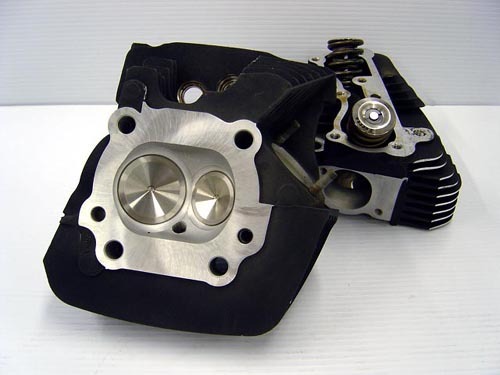 Your chambers are then sized for your target compression ratio with the pistons you intend to use and the head is decked for a perfectly flat gasket surface. 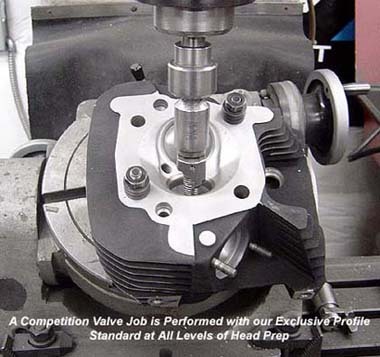 We've had numerous customers break 100rwhp using this level of head prep on their Twin Cam. It's a truly a superb performance value. If you're looking to Smash your competition, this service is for you! The Smash level is a definite step up the performance ladder, for riders who want a HOT street or entry level race bike. All of the same services as the Impact level are applied to the heads: thorough cleaning and inspection, 4-Axis CNC porting, new bronze manganese guides, our exclusive competition valve job, chamber sizing, decking, flow testing and assembly with new viton valve stem seals. But there are a couple of key differences. Number one, we include a set of our oversized high flowing stainless steel valves, all the way up to 1.900" intake and 1.615" exhaust. Naturally, we set up your ports and seats to match these large valves. The end result is substantially more flow than can be achieved with the stock valves. Second, we pair these new valves with a brand new high lift performance spring pack. The exact spring pack we'll use is selected specifically for your application (cam grind and maximum rpm); more spring than necessary causes extra wear and less than necessary causes valve float or worse. For moderate lift cams (up to .550") and rpm ranges we recommend the factory beehive spring pack, which will save you some money. 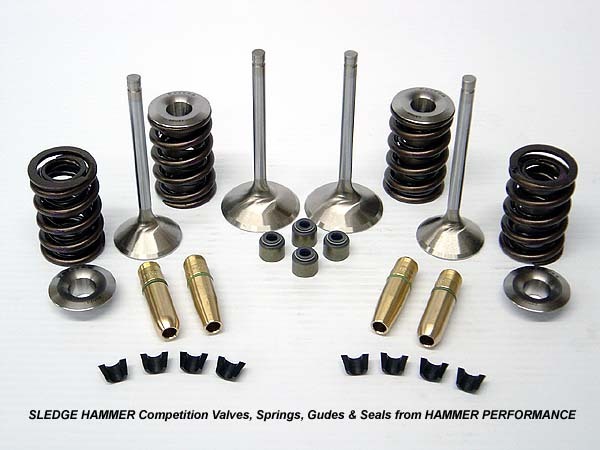 For more severe applications we'll set your heads up one of our top quality Hammer Performance dual spring packs (we have spring packs all the way up to .700 lift! )and include 10 degree locks and titanium retainers. Either way, a set of Smash heads will take you to a whole new performance level. 110+rwhp on 95ci is not unusual with these heads and matching components. They also make a great set of street heads for any size motor. Hit it as Hard as You Can, Use a Sledge! For your maximum-effort engine, we offer the Sledge Hammer service. The Sledge service builds on the Smash service, including all of the high-tech preparation and premium componentry. 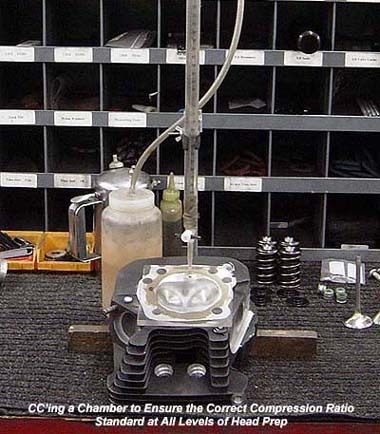 But what if your application needs even bigger valves, that require a seat change? What if you want to use an angle dome piston? Or install compression releases? Or dual plug your heads? Sure, you can add those services (and others) to your Smash heads ala carte. But the Sledge service includes any or all of these extras for no extra charge, saving you money! But the real advantage to the Sledge level is a whole different, exclusive porting process. 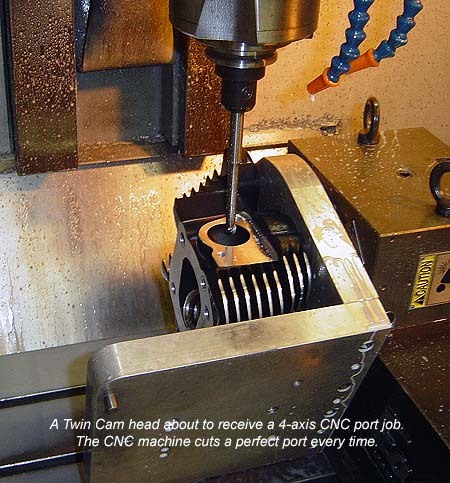 You see, CNC is a great way to port heads. It results in far more repeatability and consistency than is possible with a human using a die grinder. But it's big strength is also it's big weakness; every port comes out the same. So what do you do when the size of your motor, and the way you have it cammed, and the way you intend to run it, is not a perfect match for the CNC port profile? Well, until now your choices were to get a hand porting job (and hope that the person with the die grinder does it well matched to your application, which is a big "if"), or live with a one-size-fits-all CNC porting job. 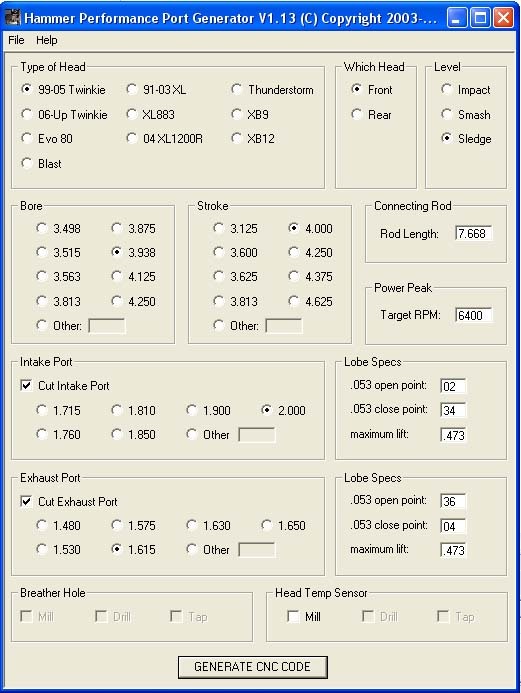 As you can see, our port generating program, when set for Sledge heads, allows key engine parameters as well as target rpm to be input. Based on these numbers, the program calculates the ideal port cross sectional area for the application and generates a CNC program, on the fly, to perfectly match. This program was developed in-house, and nobody else has anything like it. If you want the advantages of CNC, but still want your heads custom-fit to your application like a fine Italian suit, Hammer Performance has the answer! This process has been in place and continually refined since 2003, and it's been used on literally thousands of heads since then. The results have been stunning, from the hundreds of satisfied street riders to the numerous records broken at the Bonneville Salt Flats. The Sledge level includes even larger oversized high flow stainless steel valves than the Smash level (up to 2.100" is possible in a Twin Cam head) and a spring pack matched specifically to your application (up to .800" lift!). Titanium retainers and super strong 10 degree locks are standard at the Sledge level. Call the experts at Hammer Performance today to discuss your project and make sure you get exactly what you need.